Pat the chicken pieces dry, season them with salt and pepper, and dredge them lightly in the flour, tapping off any excess. Heat a-large sauté pan fitted with a lid over medium-high heat and add the 1/3 cup olive oil. When the oil is hot, add the chicken pieces (in batches, if necessary), browning them very well on both sides. When browned, remove the chicken from the pan and set aside. Pour off all but about 3 Tbs. of the fat from the pan. Turn the heat to medium low and add the onion, celery, and carrot. Sauté until they’re soft and fragrant, about 6 or 7 minutes. Add the sugar and vinegar to the pan and let it bubble for about 1 minute. Return the chicken pieces to the pan and turn them over in the vegetables once or twice to coat them. Increase the heat to medium and add the wine, letting it boil until almost evaporated. Add the chicken stock and oregano, cover the pan, and simmer on low heat until the chicken is just about tender, 35 minutes, turning the pieces once or twice during cooking. 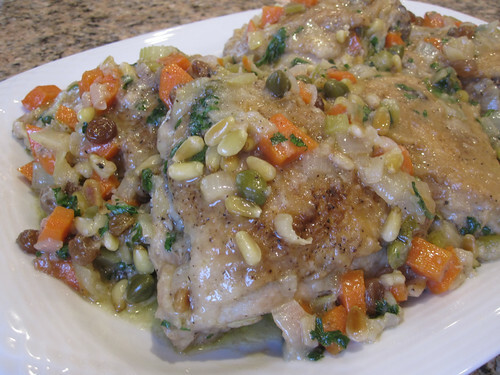 Add the raisins, pine nuts, and capers and simmer to blend the flavors, about 5 minutes. longer. The sauce should be reduced and thickened but still pourable. If it looks too dry, add a splash of chicken stock or water. Taste for seasoning. It should have a nice balance between sweet and sour but not be too aggressive. Add more salt, pepper, a splash of vinegar, or a pinch of sugar to balance the flavors. Arrange the chicken on a large serving platter. To the pan, add a drizzle off your best-extra-virgin olive oil and the chopped parsley and mix it into the sauce. Pour the sauce over the chicken and enjoy!